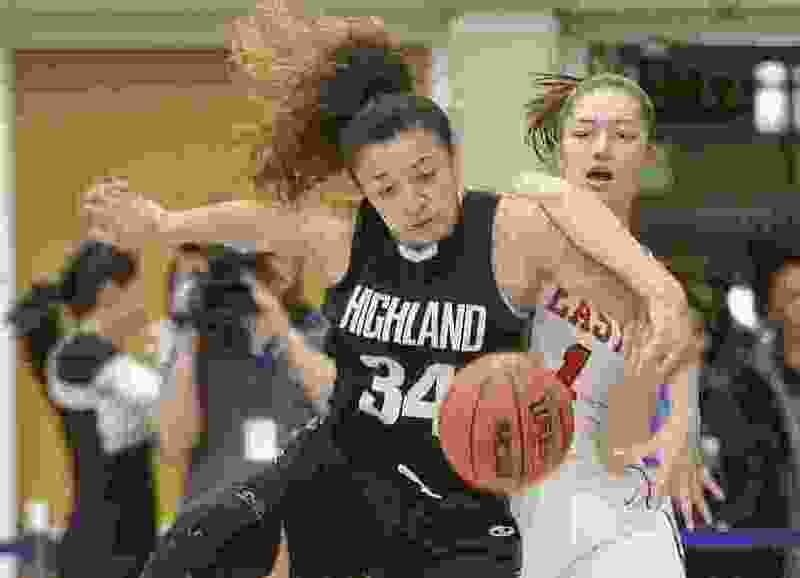 (Leah Hogsten | The Salt Lake Tribune) Highland's Misini Fifita (34) and East's Desrae Falatea. East faces Highland in their semifinal game of the 5A High School Girls' Basketball Tournament at SLCC in Taylorsville, Friday, Feb. 23, 2018. Schools in the 5A and 6A classifications are getting a significant change to their boys and girls basketball schedules for the 2019-20 postseason. Boys and girls teams that qualify for the playoffs will now play during the same week, in the same venue, the Utah High School Activities Association announced Wednesday. The change will affect the quarterfinal round through the championship round. In the past, the boys and girls tournaments were held approximately a week apart. Under the new Ratings Percentage Index format announced in late January, it could have been possible that no teams played a game in the first week of the tournament due to receiving a bye, which would have resulted in teams having to play up to four games the following week. The new change makes it so teams play a maximum of two games in the first week, and three the next, UHSAA Executive Director Rob Cuff said in a news release. For girls 5A and 6A teams, the change means they no longer will play at Salt Lake Community College, where later rounds have been held for more than 20 years. It also means the tournament will not have to start on President’s Day like in previous years. SLCC will now be available to the lower classifications in future years, per the release.